Cashmere hat: £24.99, H&M. Coat: Marks & Spencer (old). 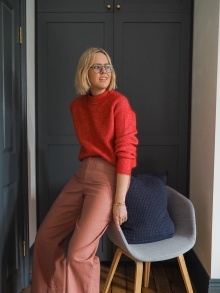 Jumper: £69, And Other Stories. Jeans: £32, Asos Maternity. Bag: £19, Arket. Shoes: £49.99, Mango. Lipstick is Bobbi Brown ‘Bright Poppy’ which is discontinued but I also recommend ‘Sunset Orange’ as an alternative (which I also love, you can buy here). Photographs: Christopher O’Donnell. I had a really quiet January, workwise. I would usually be off on high summer styling campaigns this time of year but at 8 months pregnant, travel has been limited. But I also realised a huge part of January for me is organising show schedules, tickets, travel and projects for February. Not this year – and I couldn’t be happier. The shows, for me, have felt less and less relevant lately. 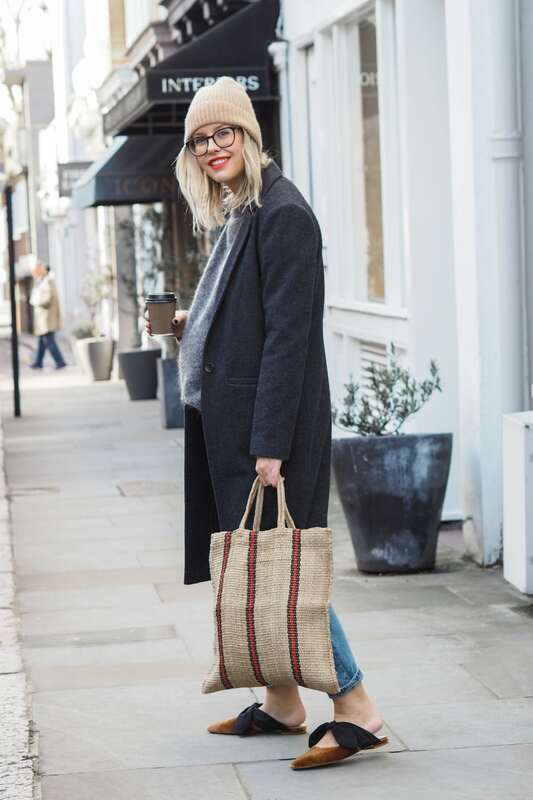 Especially in London – I only attend a handful of more High Street ones these days (Topshop, Designers at Debenhams such as Preen and Jasper Conran etc) and feel it’s more about what I’m wearing anyway – and that kind of pressure I just don’t need right now. Yes, it’s nice to catch up with Fashion friends and PRs over the week but I’m much more up for meeting friends after work over a burger for ‘real’ time anyway. Its the first Fashion Week where I won’t be doing *anything* though – I often have a low profile but end up doing a few events. This season, it won’t even be on my radar – I’ll be in my comfiest casuals and won’t even have FOMO of everyone teetering around in heels trying to say warm and keeping their hair out of the sideways rain and documenting every last second. As I’ve mentioned before, Fashion Week isn’t the most glamorous – even if it might be depicted that way on social media. 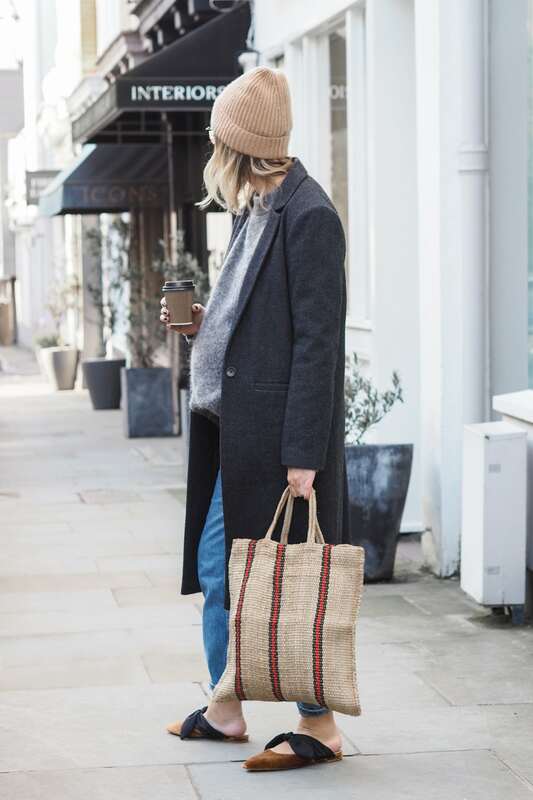 It’s a bit of a slog – traipsing all over town on public transport, spending too much money on food, snacks and ubers when you’re out on a weekend from 8am – 9pm on your feet all day. It’s a bit relentless (I wrote all about it here last year). And I get my weekend back…instead of the 9am Sunday morning show, I’ll be eating breakfast on the couch. Things are definitely changing for the better. So, about the outfit. As mentioned on Instagram, this is the closest I’ve felt to ‘myself’ pre-pregnancy for a long time. 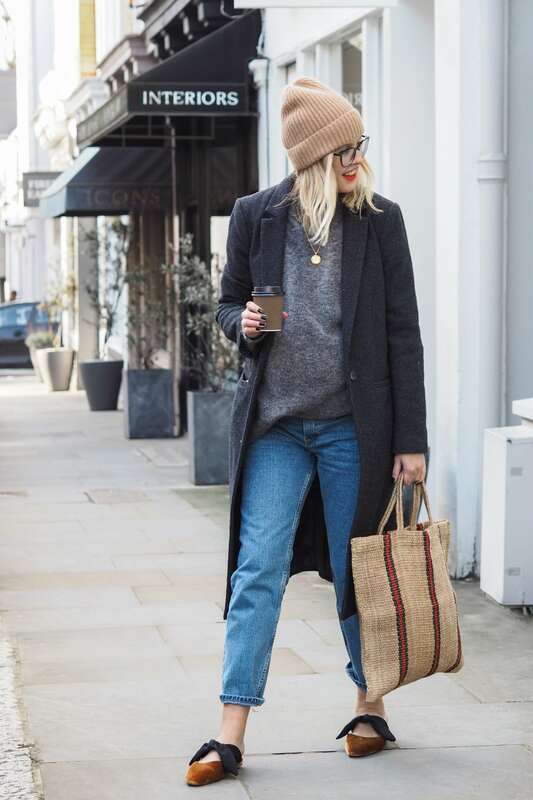 Straight leg jeans, good knit, crombie coat and flats. Maternity dressing hasn’t come easy for me, especially as I didn’t want to completely lose my identity style-wise. Despite being in my third trimester now, I’ve actually been feeling pretty good the last few weeks, my energy is up (even if my sleep is pretty out of whack – as I sit and type this at 4am). So it’s nice to put on something where I feel like my ‘old’ self. The day we shot this was actually lovely and sunny, so bare ankles were just about bearable – plus my ankles had swollen a bit too much for boots this particular morning! But do check out Mango for great flats at the moment – especially mules, which are great for pregnancy and beyond – I also bought a fuschia pink satin pair which are a bit ridiculous but I couldn’t help myself! The bag is Arket – I’ve only bought a few items from there but love the concept…very minimal and great for gifts. Someone asked me on Insta whether it was a good investment or just a bit of sack material and the answer is kind of both. It’s a hessian eco bag essentially BUT it’s sturdy, fits loads in (laptop, A4 folders for work etc) and it’s also a fab bag to take on a trip as it takes up no room in your luggage. And it’s £19. Cashmere hat: £24.99, H&M. Coat: Marks & Spencer (old). Jumper: £69, And Other Stories. Jeans: £32, Asos Maternity. Bag: £19, Arket. Shoes: £49.99, Mango. So here’s to watching London Fashion Week from afar, in comfy clothes and in the warmth of my own home…eating carbs. Probably. Especially love the Mango shoes, they look stylish but comfortable. What a great combination. You packed your bag yet? Also I hope someone will post news here of your little one’s arrival which must be coming up soon? What a great combination, stylish yet comfy shoes! You packed your bag yet? Also I hope someone will post news here of your little one’s arrival which must be coming up soon? Hi Alex, just wanted to say sorry but I am having trouble posting so I end up sending two. First one seems to mention something along the lines of having posted it before? I’ve given up buying mules because I hate the way I constantly have to clutch my toes to keep them on, but those pink satin ones would almost be worth it…..
Best wishes for a smooth delivery, I’ll be looking forward to hearing the good news. Great outfit, bag and shoes look so cool, bright orange lip and smile!!! It‘ impossible not to like you Alex, and your thoughts and the way you express your attitude straight forward, so encoriging. Your post on how you are reducing stress level was great and inspiring. After either traveling for job or working from home office, I decided to rent coworking space, inspired by your experience. And I couldn‘t be happier, thank you Alex! LOVE LOVE LOVE this post! Such a cute and cosy outfit. Also I am so excited to be spending this week in cosy clothes rather than squeezing my toes into heels!